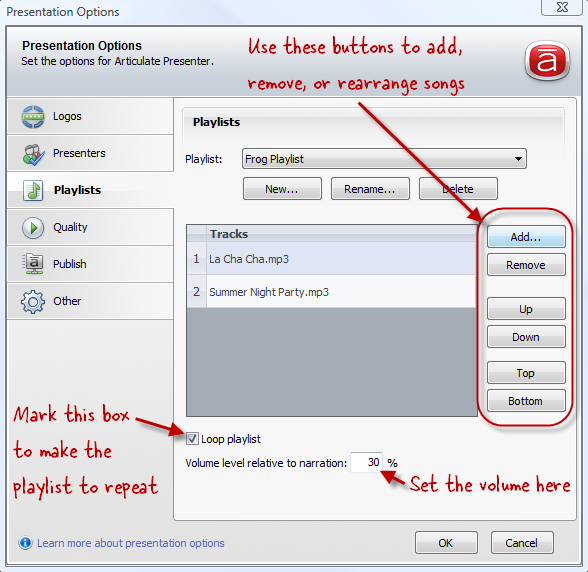 Presenter ‘09 includes a cool feature that allows you to add background music or other forms of audio to your course or presentation. When you apply a playlist, it’s separate from your slide narration and plays in the background. You can even set it up to play continuously across multiple slides if you want. Let’s take a look at how to do it. From the Articulate menu, select Presentation Options. Click New to make a new playlist. Enter a name for your playlist and click OK.
Now you'll need to add some sound files. Click Add, navigate to your audio file, and click Open. Do this for as many audio files as you'd like to include in the playlist. (To select multiple files at once, use shift-click and then click Open.) Once you've added some files, you can use the buttons on the right side of the window to remove any song from the playlist, or to rearrange their order. 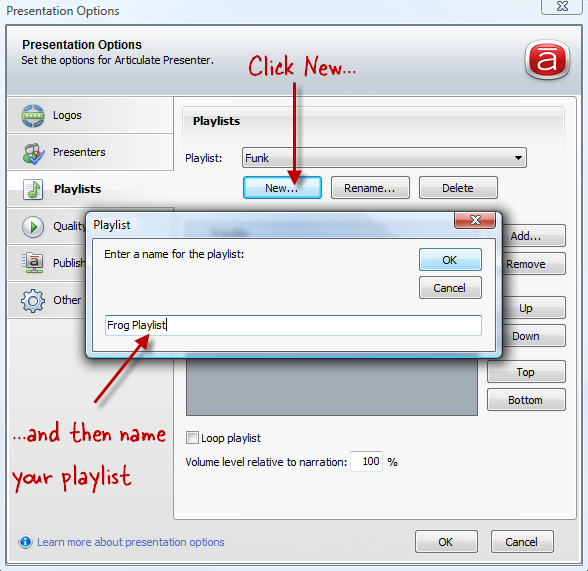 If you want the playlist to repeat when it plays in your presentation, mark Loop playlist. When learners view your presentation, if the playlist reaches the end, the music will start over again at the beginning. If you want the music to play at a softer level than your audio narration, you can use the percentage field to set the volume relative to the narration. From the Articulate Menu, choose Slide Properties. Find a slide where you want the playlist to play. Use the dropdown in the Audio Playlist column to choose your playlist. If you apply the same playlist to consecutive slides like I've done below, and if your music lasts longer than the slide duration (or if you chose to loop the playlist when you created it), then the audio will keep playing seamlessly when you transition from one slide to another. 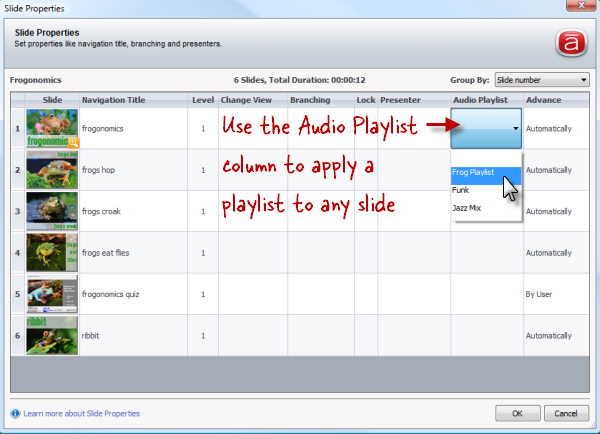 TIP: To apply the same playlist to multiple consecutive slides, Shift-Click to select the slides and then right-click the group and choose Audio Playlist. Or, apply a playlist to all your slides at once by right-clicking on the Audio Playlist column heading and then choosing Audio Playlist. Click OK when you're done applying playlists. Now all you need to do is publish, and your presentation will include the background music you applied.